The Argus sat down with a handful of international students to discuss their experiences, sentiments, and histories. For many, the election yielded uncertainty with regard to postgrad plans, travel, visas, political discourse, complicity, and general perspectives on the United States. “I kind of thought that his election wouldn’t make that much of an impact, that the president was more of a symbolic figure than someone that was capable of having absolute control,” recalled Danielle Lobo ’19, a U.S. citizen who was born and raised in Karachi, Pakistan. Kahindi, who is the president of the African Students Association (ASA), is a citizen of Kenya. She also brought up the distinct post-election powerlessness and perpetual fear of forced return. Maxine Gibb ’19, a citizen of South Africa, a permanent resident in the United States, and the vice president of the ASA, posited another way in which treading lightly became her new norm. “I’m cautious of being open about my political views on public platforms in case it might somehow affect my chances of getting citizenship,” she said. Keith Mundangepfupfu ’19, a citizen of Zimbabwe and the treasurer of the ASA, similarly characterized the process as unforgiving and unaccommodating. For seniors, this is all the more urgent. Kahindi discussed the difficulties of trying to get employed post-University. “You start applications and then you see that [U.S. companies] don’t sponsor,” she said. Kahindi hopes to find someone to hire her for 12 months while she applies to law school. Those precarious 12 months would be granted through Optional Practical Training (OPT) for F-1 visa international students. The OPT is an authorization for temporary employment designed according to one’s area of study. Humanities and social science students have 12 months, while STEM students are eligible for a 24-month extension. Some pre-graduation summer internships, however, are deducted from OPT time. Also, leaving and re-entering the United States can be especially difficult, unless there’s a specific agreement with the employer. In other words, for many international students, there are no luxurious training wheels, no interim time to figure things out. Instead, the diploma is granted and the clock begins its countdown. Multiple students described the distinct experience of international students who must think about post-grad in a career-oriented, logical, un-whimsical, perhaps un-Wesleyan manner. Aditi Shenoy ’20, a citizen of India and a resident of International House, spoke to the appeal of large corporations in light of their ability to sponsor international employees. “I don’t want to sell my soul to a big corporation, but that’s probably going to happen,” she admitted. For some, that Goldman Sachs job opening that many University students deem as “selling out” might be one of the only realistic options. Mundangepfupfu evoked a sentiment similar to Gibb’s: perhaps farsightedness is an overlooked criterion for international students, whether or not in regards to one’s career or one’s tweets. He then explained the intricacies of the increased barriers to entry for businesses sponsoring international students as employees. Hammami pointed to a different type of rigidity: a blatant flaw in the United States’ racial categorization. Charles Qian ’19, a citizen of China who recently returned from studying abroad in England, shed a different light on post-election travel. Hammami had a different experience with the daunting prospect of travel last summer, even with the precautions of a shaved beard and a Wesleyan hoodie. He recalled being subjected to a 30-minute interview with the TSA that demanded information on his family, the content of his writing as a journalist, and more, which he attributed to a random search for people named Mohamed. Besides travel and documentation, the election impacted international students in other concrete ways, namely the perceived precariousness of visa policy. 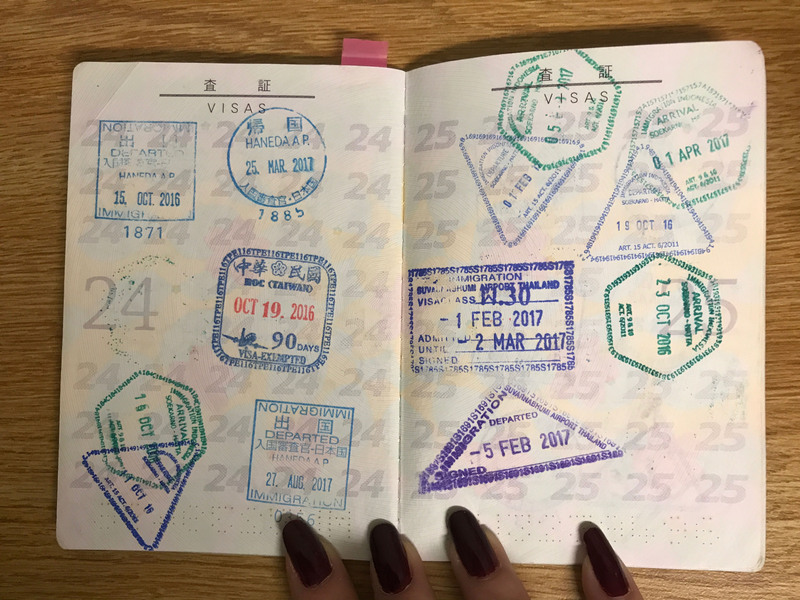 Janice Watson, the University’s Coordinator of International Student Services, described the visa process in an email to The Argus. While there may not be concrete visa legislation changes, anecdotes from students suggest there are other developments. Dan Tran ’20, a citizen of Vietnam who was born and raised in Russia, discussed the manifestation of Trump’s isolationist statements in diplomatic relations. He specifically cited the incident over the summer where Putin announced a plan to expel 755 U.S. diplomats by Sept. 1. Teresa Naval ’19, a citizen of the Philippines and a housemate of Shenoy in International House, brought up a policy that is specifically restrictive for Filipinos. What Naval is referring to is what the U.S. Embassy in the Philippines calls a “Diversity Visa”, in which a yearly lottery grants 55,000 immigrant visas. Filipinos are excluded from this pathway to residency or citizenship. Ally Gomberoff ’19, a Canadian citizen and another resident of International House, expressed post-election instability of a different sort: sentiments of complicity, doubt, and perhaps a wavering sense of purpose in this country. For her, the election brought questions of participation to the forefront in the political system of the U.S.
Gomberoff expressed frustration with the American tendency to valorize Canada. She also took issue with the slew of American jokes about mass moves there as indicative of a distinctly American entitlement to the globe. Meanwhile, others scramble to acquire visas through an arduous, bureaucratic system. Ayat Muhaisen ’20, a student with dual Canadian and Jordanian citizenship, discussed similar post-election doubts to those of Gomberoff. Ultimately, since the experiences of international students at the University are significantly varied, any overlaps are tenuous. That said, there are echoes of frustration, urgency, complicity, doubt, fear, and, perhaps most importantly, uncertainty under the current political climate. Many international students continue to think of the University as a lovable, if imperfect, home. But for some, like Muhaisen, these post-election sentiments forced them to reckon with an unsettling question. “Why would I put myself here?” she asked. Sadly, Trump’s contentious issue is yet one more thing that makes being an international student away from home difficult, compounded by our complex culture and language problems. Welcoming and assimilation assistance must come from numerous sources to aid these young people embarking on life’s journey. Most struggle in their efforts and need guidance from schools’ international departments, immigration protection, host families, concerned neighbors and fellow students, and even informative books to extend a cultural helping hand so we all have a win-win situation.